To shuffle means ‘to walk without lifting your feet,’ or ‘to drag your feet along the ground, as in dancing.’ It also means ‘to rearrange things randomly,’ or ‘to mix playing cards.’ As a noun, a shuffle is a dragging movement, the action of rearranging or mixing things, or a type of dance or piece of music. Shuffle dates back to the early 16th century, and originally meant ‘to put something together hastily.’ Its origin is uncertain. Some linguists think that it evolved from the Middle English verb shovelen (to move with dragging feet), a frequentative of shoven (to shove). Others believe that it came into English from the Middle Low German schuffeln (‘to walk clumsily’ or ‘to deal dishonestly’). Either way, it can probably be traced back to the Proto-Germanic scubanan and the Proto-Indo-European root skeubh– (to shove). Shuffle is related to the Old Norse skufa, the Old Frisian skuva, the Dutch schuiven, the Old High German scioban, the German schieben and the Danish skubbe (to push or thrust), as well as the Lithuanian skubti (to hurry), the Polish skubać (to pluck), the Albanian humb (to lose), and the English words shove, shovel and scuffle. The senses ‘to walk slowly without lifting your feet,’ ‘to push along gradually,’ ‘to rearrange things randomly’ and ‘to mix playing cards’ all appeared in the mid-16th century, while ‘to move from one place to another’ dates back to the late 16th century. The noun comes from the verb, and dates back to the early 17th century. The original meaning, ‘an evasion or trick,’ expanded to include ‘wavering or undecided behavior meant to deceive’ in the mid-17th century. Shuffle as a type of dance is also from the 17th century, as is the card-related meaning. The sense ‘a slow, irregular way of moving’ first appeared in the mid-19th century. 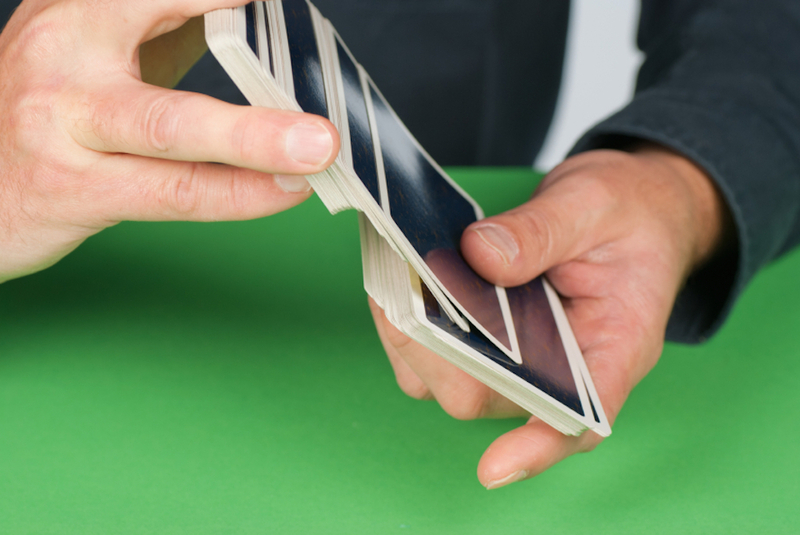 The expression ‘get lost in the shuffle’ dates back to the late 19th century, and is a figurative use of the card-mixing sense.